This species varies enormously both in its colouring, the markings on the leaves and the spines on the leaf margins. Origin and Habitat: Aloe somaliensis occurs in Djibouti and northwestern Somalia with an extent of occurrence of about 6,200 km² in five known subpopulations. It may possibly cross the border into Ethiopia. Altitude range: from 700 to 1,700 metres above sea level. Habitat and Ecology: Aloe somaliensis has been collected from bushland and Acacia-Commiphora bushland on rocky sandstone slopes and limestone where it grows solitary or in small groups. Three subpopulations are within close proximity to towns which are likely to pose a threat to the species (loss and degradation of habitat through agricultural expansion). Furthermore herded animals represent a threat to the general habitat of this species through overgrazing and trampling of animals. The trend of the population is not known due to lack of field observations in recent years. Aloe somaliensis is widely in cultivation in botanic gardens. Description: Aloe somaliensis is stemless or short-stemmed aloe species single or forming small groups with strikingly marked leaf-blades. This species varies enormously both in its colouring, the markings on the leaves and the spines on the leaf margins. Previously two varieties were recognized, the nominate form (var. somaliensis) and var. violacea. But Carter, Lavranos et al in Aloes: the Definitive Guide, do not recognize a variety marmorata. Leaves: (12-)16-17(-20), compressed rosulate, spreading or ascending, fleshy, lanceolate-tappering, inclined, tip recurved, basally convex on both sides, upper surface grooved-concave, about 20-30(-40) cm long, 6-8 cm wide at the base, glossy dark green, often brownish with many whitish linear-oblong irregular spots and, in var. marmorata, darker green markings, lower face paler with more spots, surface smooth. Margins armed with strong, triangular brown teeth c. 4 mm, pungent, reddish-brown, 8-10 mm apart. Sap drying brown. Inflorescence: Racemose 60-85 cm tall, suberect to oblique, with 5-15 branches, lower branches sometimes rebranched. Racemes cylindrical or with pendulous flowers subsecund on oblique branchlets, 15-20 cm long, 5 - 6 cm in diameter, lax to sub-dense. Bracts ovate-attenuate, 6-8 x 3-4 mm. Pedicels 8-10 mm. Flowers: Pinkish-scarlet (var. somaliensis) or bright red (var. marmorata), minutely speckled, 28-30 mm (c. 26 mm long in var .marmorata), base rounded, 9 mm across ovary, very slightly narrowed above and towards mouth outer tepals free for 10–13 mm. Anthers exserted 1–2 mm. Stigma exserted 2–3 mm. Ovary olive green, 6 x 3 mm. Similar species: A. somaliensis looks quite similar to Aloe hemmingii as a young plant, but grows larger and its spots often become less distinct with age. It has a larger, more-branched inflorescence than A. hemmingii, and the flowers are not pink, but instead are typically a dull red colour. Aloe somaliensis C.H.Wright: (var. somaliensis) leaves spreading, 15-25 cm long, brownish-green, with only whitish spots; perianth pinkish-scarlet; 28-30 mm long. Distribution: Djibouti and northwestern Somalia. Aloe somaliensis var. marmota Reynolds & P.R.O.Bally: up to 40 cm long, obscurely speckled with diffuse darker green longitudinal markings giving a marbled effect; perianth bright red; c. 26 mm long. Distribution: Somalia near “Upper Sheikh”. 2) Weber, O. & Carter, S. 2013. Aloe somaliensis. The IUCN Red List of Threatened Species. Version 2014.3. <www.iucnredlist.org>. Downloaded on 10 January 2015. Cultivation and Propagation: Aloe somaliensis is a very easy species, and easy to find, too. It is moderate offsetter that fills out pans to form very attractive domes, and will eventually take over an area. To reach this state, however it requires patience and a careful hand with watering. Given the right conditions they can be grown as a houseplant. Growth rate: This is a slow to moderate growing aloe, and it will tolerate drought and neglect once established. Soil: Grow it in light, fertile, well-drained, moderate soils, with a slightly acidic pH (5-6). Exposure: Prefer half shade (kept away from direct sun in summer) but it will get nicely redder colour with brighter light (not direct sun). Hardiness: This plant doesn't like cold weather, therefore in the Spring it is best to set it outside only when the temperatures are above 15°C. Can endure temperatures below 5°C for short period, but only if the soil stays completely dry. 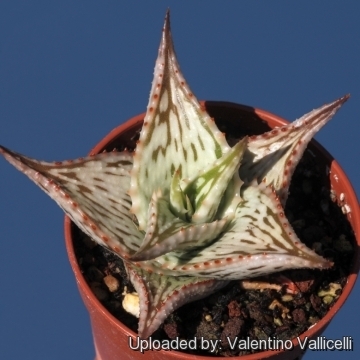 Pests and diseases: This plant is particularly prone to aloe mite damage. Maintenance: Removal of old flower stalks; It is a suckering species, and one plant can eventually cover a large area. Divide the crowded clumps periodically. During the winter months, the plants should be grown cool to initiate flower development (about 5-10°C). 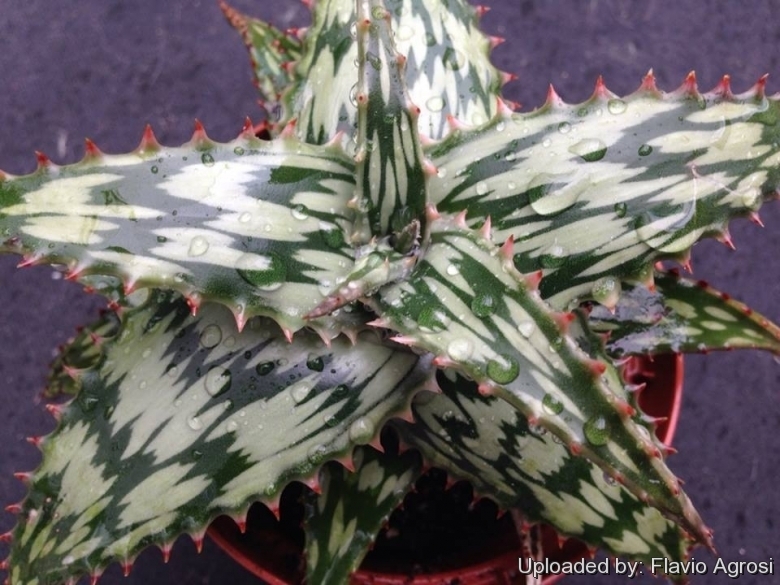 Warning: It has sharp thorns and is one of the more painful aloes to trim without gloves. Reproduction: Usually by Offsets or (rarely) by seeds, it has to be restarted periodically as the lower leaves shed and it looks bare. Take a branch or stem cut off, allow it to dry for a day or so until the wound has sealed, and then plant it in well-drained soil or sand. They need not be rooted in any particular place and then transplanted, but can be placed directly into their permanent place in the garden. This aloe can also be grown from seed, sown in spring. Seed should take three to four weeks to germinate, and the seedlings must be protected from frost.